Thanksgiving holidays are one the most cherished ones. Family and friends get together for a great feast and fun – and you want to make everything just perfect and very special. 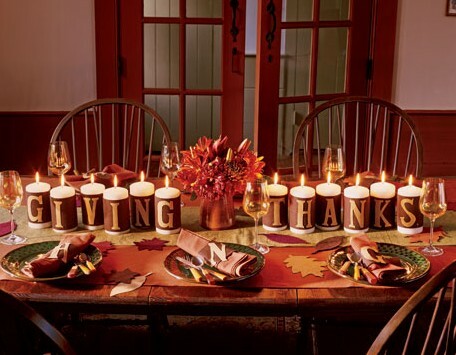 One of the things is how to best decorate your table – and there is never enough ideas! I have put together a list of how to and what to – hope that it will help to make your Thanksgiving very special. You can bring the beauty of the season into your home – use the colours, foliage and colourful fruits of the season – and you will set a spectacular Thanksgiving table in no time! 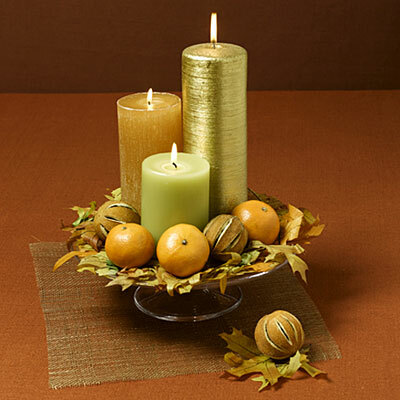 Use autumn coloured candles – you can set them in a wooden or rustic metal candle holders and use them for your centerpiece along with fall foliage, wheat springs, clusters of berries, mini pumpkins or even seasonal vegetables. 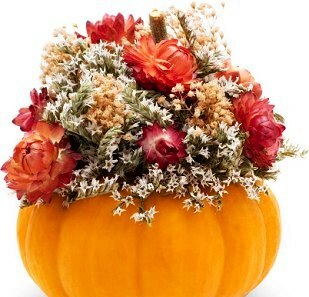 Use hollowed-out pumpkin instead of a vase to put flowers into. 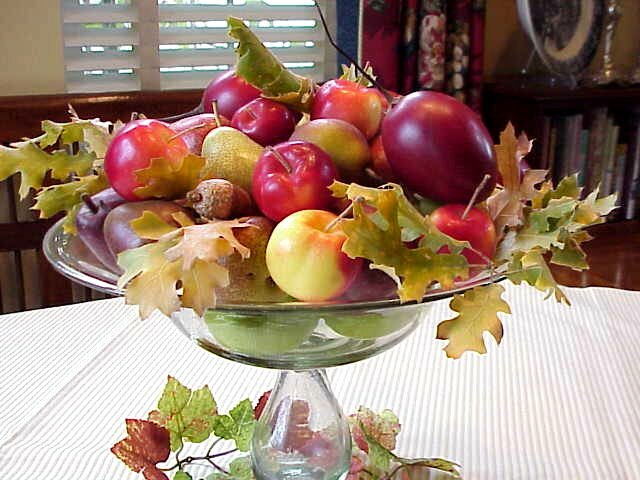 You can also enrich this kind of centerpiece by adding berries, wheat or leaves around the base. Set the table with tablecloth, runner, placemats and napkins – choose fall colours and use prints very sparingly, avoiding making your table look too busy. Always keep you focus on the centrepiece. You can use napkin rings, keeping in the fall theme in colours and style, or you can fold your napkins into shapes instead of just laying them flat. Choosing your dishes can go either way – you can use fall colours if you wish  personally I prefer using white dishes and focusing colours into the decor. If you need to make place cards, consider collecting good size leaves, rinsing them and patting them dry. Then you can write each guest’s name on each leave with a black felt-tip pen and place the leaf in centre of each setting. It is easy to enhance your table with using season inspired and natural elements – like branches of beautifully coloured leaves. You may want to take a walk with your children and pick some branches and leaves to use – it is very inexpensive and very effective way to decorate. Making a centrepiece for your table is easy – and you can use fresh fall flowers that you arrange in a suitable container. 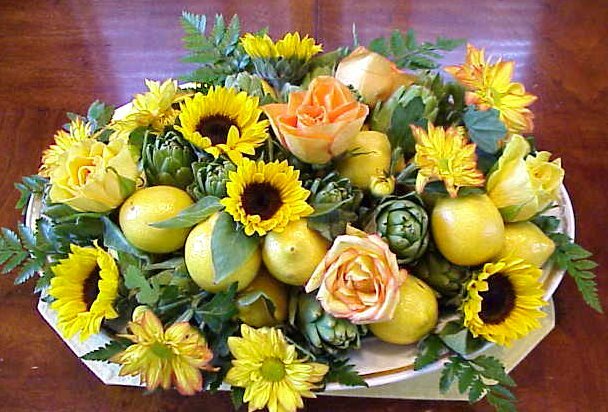 Soak a block of florist’s foam in water, place into the container and create the centrepiece of your own design. Ideal flowers are dried pink amaranthus, white or coloured asters, deep red or orange roses, black-eyed susans or colour chrysanthemums. All you have to do is snip the stems equal length and insert them into the soaked foam in your container. You can create accent with springs of berries or wheat. Placing this centrepiece on your table with couple of candles on each side will look terrific! If you decide to use leaves as your main theme, consider using a dark coloured tablecloth – it will set off the colour of leaves beautifully. 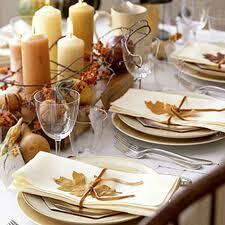 Use lighter colour napkins, roll them and secure them with fall shaped and coloured leaves. You can add some richness to your table by using gold coloured candlesticks or candles. And it works very well to use fall fruits or vegetables, like a mix of green and yellow gourds, white and orange mini pumpkins or apples and pears.